At Foot HQ, Koya and Bludgeon observe Bebop and Rocksteady goofing off and wince in disgust at their disrespectful behavior. Regardless, the pair (who consider one another siblings) are just happy to have been accepted back into the fold by their master. On the bridge, the Turtles find unexpected help in their battle against the Mousers and Flyborgs: Karai and the Foot Clan! 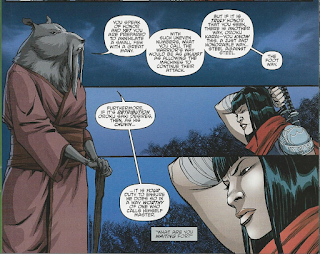 Karai approaches Splinter and tells him that she still wishes to enforce her master’s command, but finds Stockman’s methods dishonorable and intends to finish her enemies ninja-to-ninja. Splinter, however, has a better idea and Karai listens. On Burnow Island, the Fugitoid finishes growing a new shell for Donatello’s comatose body, but balks at the procedure to reattach it. 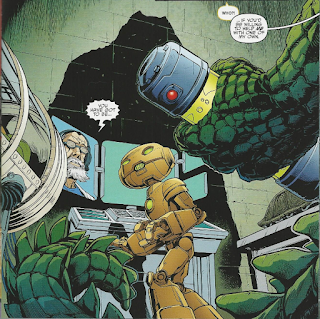 Harold doesn’t see his dilemma, but the Fugitoid informs him that if he were to take ooze to heal Donatello, then it would kill at least one of the Utroms in stasis. The Fugitoid and Harold are at an impasse… at least until a scaly, long-tailed mutant gripping a canister of ooze steps into the room and offers a solution. 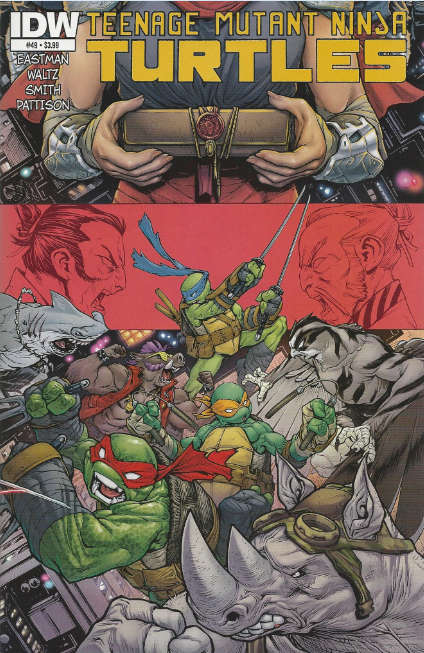 With that, Splinter and the Turtles enter the arena and Splinter challenges Shredder to “The Gauntlet”. Shredder is about to refuse when, once again, Kitsune persuades him otherwise. Nobody and Alopex are ushered to the sidelines, where Kitsune explains the Gauntlet to them: Two masters may each choose four warriors to fight on their behalf. The last warrior standing may join their master for the final battle, as the two commanding enemies fight to the death. Michelangelo isn’t sure he has it in him to kill anyone, but Splinter reminds him of the conversation they had some time ago; he’s known for quite a while that the only way they’d ever be safe was to kill Shredder. Karai, meanwhile, is forbidden from joining her master in combat, as Shredder intends to punish her after the fight. With that, the Turtles and the Foot Mutants enter the arena and begin their battle. The Turtles put up a good fight, but are ultimately overpowered by Bebop, Rocksteady, Bludgeon and Koya. Nobody wants to help, but the Foot Elite keep her out of it. While this is going on, Alopex is approached by Kitsune, who begins to magically mess with her head. 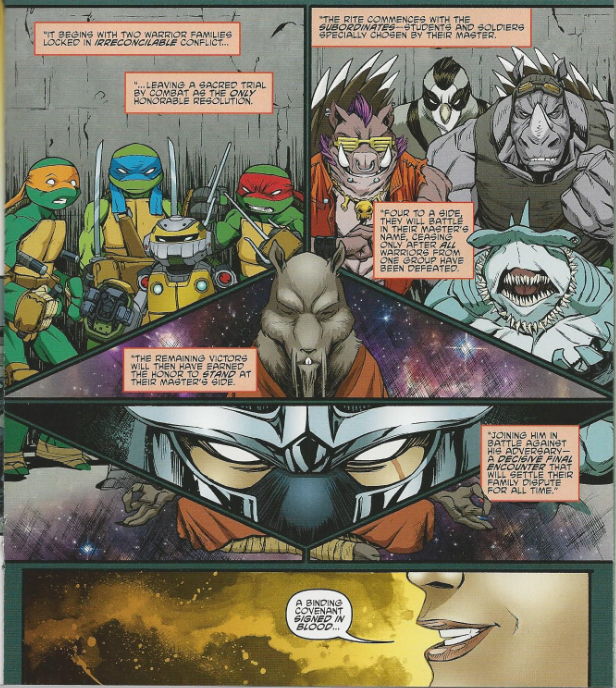 *This story is continued from TMNT (IDW) #48. The story continues in TMNT (IDW) #50. *The ranks of the Foot Clan were severely depleted after the events of TMNT (IDW) #44. 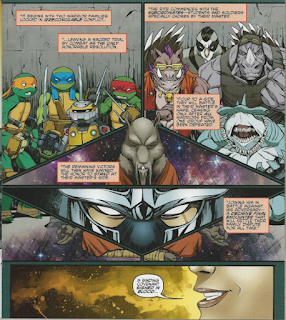 *Splinter gave his sons the speech about ultimately having to kill the Shredder in TMNT (IDW) #14. *Kitsune was last seen manipulating Alopex in TMNT (IDW) #37. *This issue was originally published with 3 variant covers: Regular Cover by Mateus Santolouco, Subscription Cover by Eastman and Pattison, and Cover RI by Jason Howard. I’m pleased that the fight against Baxter’s robots didn’t take up any more time than it already has. As I remarked last issue, I was getting a little bored with that development and this issue switches gears from that cliffhanger almost immediately. It sort of turns into setup for the really for REAL ultimate showdown in the next issue, but I still found that more engrossing than robot-smashing. The character work on Karai was the real star of this issue and something I felt was a long time coming. She’s been around in the IDW series since nearly the beginning, but her development has been considerably overdue. While I’m actually impressed the writers took the long road in bringing out her willingness to cooperate with the Turtles (though she isn't yet their ally), much of Karai’s stint in this title has been either as a lackey or an altogether nonentity. Her change of heart is a natural development; she’s been dissatisfied with her grandfather’s erratic behavior since practically her introduction. And after the ruin Shredder’s led the Clan into since taking over, her decision to go behind his back certainly makes sense to her character arc. It’s more the “nonentity” thing that bugs me. Karai had been out of the picture for such a while, you kind of forgot she was ever supposed to be important. I’m rather looking forward to seeing Karai (presumably) step up to bat after #50. IDW’s Shredder has been fun, but his “Raaaarrr VENGEANCE” shtick could only carry on for so long. Speaking of Shredder and the Foot Clan, I hadn’t really thought about what disrepair they were in until it was brought up in this issue. I had just assumed that after “City Fall”, the Foot were as powerful as they’d ever been. And I still sort of feel like maybe we missed some of the whole “downfall” of the Foot we’re just now hearing about. A lot of Foot Soldiers died on Burnow Island and the Purple Dragons defected, but was there anything else? “City Fall” saw the Foot rise to the top of the food chain and consolidate all criminal power in New York City. Now all of a sudden they’re in shambles because some Foot Soldiers died and a street gang decided to quit? That was a considerably short reign as the criminal kings of New York. The first half of the Gauntlet was a beautifully rendered montage of fights from Cory Smith, but an epic battle that only spans 3 pages. I’m sure the Turtles will rally and we’ll get another round in the double-length finale… or at least I hope we do. There are other things coming to a head, as well. Kitsune seems to be going all-out, manipulating Shredder’s decisions and playing him for her interests. I’d almost forgotten that she had plans for Alopex, too, and it looks like we’ll finally see what that’s all about. But more importantly: Leatherhead! Perhaps the most anticipated character yet to appear in the IDW books. Well, he hasn’t “properly” appeared yet, but who else could it be? No Cajun accent, it seems, but there's always a chance! Looking at my review, I don’t think I’m being generous enough with this issue. It features a lot of superb layouts and art from Smith and it’s dotted with strong moments, both large and small (there’s a handsome two-page spread showcasing both sides of the Gauntlet; Stockman sneaking away practically on his tip-toes was pretty funny). I guess I’m just sort of going through the same burn-out I did toward the end of “City Fall”: Too much epic. “Attack on Technodrome” and “Vengeance” back-to-back kind of drains you and I’m ready for the event arcs to be over so we can perhaps return to some smaller scale, character-oriented storytelling. That said, I’m sure #50 will be a blast. 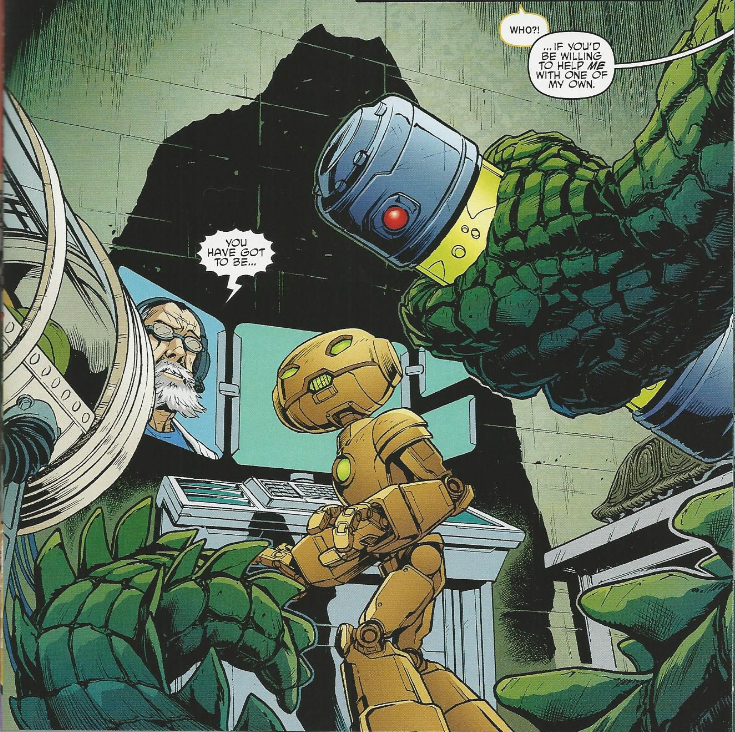 Baxter was superb in this issue as well, especially his arrogance after everyone started ignoring him once the Turtles showed up. "I'll see myself out now, thanks. Idiots." He reminded me of 2k3 series Baxter with how pompous he could be calling Shredder names right to his face even though he can easily be killed. Come to think of it this might be the shortest run of Baxter ever working for the Shredder outside of Mirage. It was only what...3 issues? Unless Shredder somehow brings Baxter back under his command again like he usually does in other series. Koya and Bludgeon's conversation about Bebop and Rocksteady made no sense; They didn't fail Shredder at Burnow Island, they (presumably to them) killed a turtle. Koya being a female was in a previous issue, perhaps the boat fight issue? Or maybe when she swooped in on the turtles in the O'Neil barn. Freaken Leatherhead!! Eyes widened and jaw dropped when I saw that panel! Another surprise was Karai an company taking out the Baxter bots. Never saw that coming. I'm going to predict issue 50 (which is not the series finale). The mutanimals and Hun show up and ruin the whole honorable thing. Alopex turns on the good guys thanks to Kitsune And her head games. And finally, Leo will stand with Splinter and watches Shredder kill him. Just finished #50. I was way off in my prediction above. A bit late to the game, I know (I read only the trades), but I thought the main reason the Foot had lost their power was that they had completely abandoned their place at the top. Lots of Foot died on Burnow Island, Shredder was gone, and Karai had little interest in having what remained of the clan follow in his footsteps. THAT'S why the city devolved into chaos; it's was a complete power vacuum, and it's why Hun declared that he was a free man.